The Add Event option allows you to create one single event at a time. This option also provides you with all of the options that are available for an Event. This is also what you see when you edit an event. 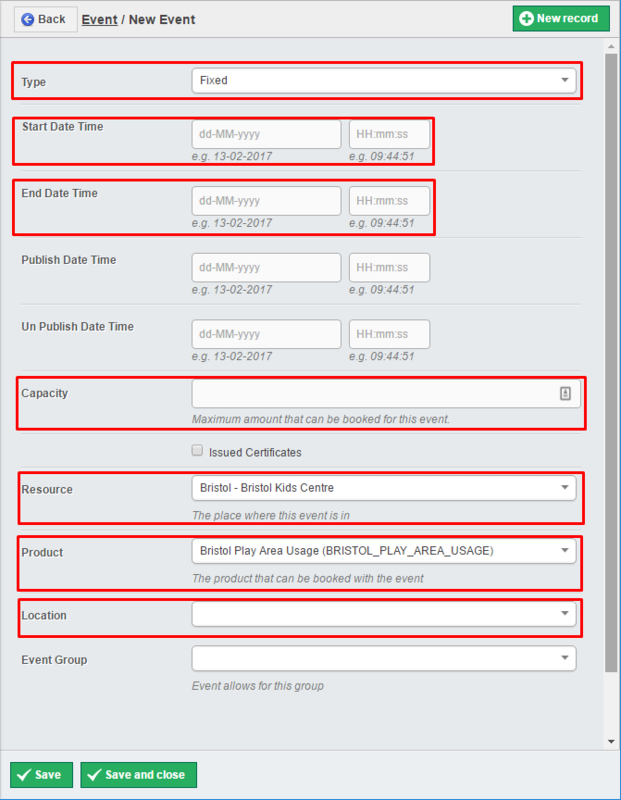 To use the Create Event Series action, click on the Actions dropdown to the top-right of the Events table, and then select Add Event option. Options: Fixed, Available or Custom (see above for details). The starting date (dd-mm-yyy) and Time (hh:mm:ss) for the event or availability. The ending date (dd-mm-yyy) and Time (hh:mm:ss) for the event or availability. The date (dd-mm-yyy) and Time (hh:mm:ss) that this event or availability will appear on the fron-end of the booking system. The date (dd-mm-yyy) and Time (hh:mm:ss) that this event or availability will dissappear on the fron-end of the booking system. The maximum number of people who can be booked onto this event or availability. Select this option if you want to issue Completion Certificates upon completion of this event. The Resource that is being used for this event or availability. The Product that is being used for this event or availability. The Location that is being used for this event or availability. This option is used to link or add Events together in an Event Group. It is reccomended to leave this setting alone. Once you have completed making any changes you want to the Event, click Save and close.